"Freedom's Shield and Hope?" Orbital ballistic missile early-warning tied to the ABM system that's in development? This is generally expected to be a pair of NOSS satellites, but I'm still keeping a fairly open mind. The Atlas is flying with an extended mission kit, and an Aft Bulkhead Carrier containing nine CubeSats. The EMK is needed to accommodate the ABC, so its presence doesn't necessarily mean that the Atlas will fly an extended mission. The CubeSats are going to a 470 km by 770 km by 63 degree orbit. Inclination is consistent with NOSS, Improved Trumpet or SDS. The mission profile given for the CubeSat deployment was two burns before primary S/C sep, and one after, however this was given as something of a generic mission, so it may not be the case for this launch. A NOSS launch using an Atlas V 411 would be direct ascent to an 1,100 km orbit. It is known that Centaur has enough fuel to deorbit itself after such a deployment (as seen with NROL-34), so in theory it should be able to reach the CubeSat deployment orbit post-separation. A Trumpet launch would leave the Centaur in a higher orbit, although it is known that it has excess capacity from the presence of secondary payloads on previous launches, and the fact that the Delta IVM+(4,2) can carry such payloads (Payload capacities aren't given for Molniya orbits, but Delta IV capacities seem to tail off quicker than Atlas V for higher orbits, so I'm basing this comparison on GTO payload, please correct me if I'm wrong). I doubt if it could make it back to the deployment orbit without making a total of four burns - I'm not sure if Centaur can even make that many restarts. SDS launches typically use Atlas V 401 rockets, and it is very unlikely that this would have changed; NROL-38 is believed to be an SDS and is still using a 401, and it is illogical to use a larger rocket just to accommodate secondary payloads. That said, an SDS would fit the mission profile; two burns up, and it could probably get back to LEO with one. The mission patch contains several interesting symbols. The three rivets and three trails behind the star the bull is stomping on could suggest that it is the third in a series of satellites, and if this were Trumpet, then that would be true. The star with trails behind it has also appeared on both previous Improved Trumpet patches, albeit with four trails, not three. If it were Trumpet, the seven or eight background stars could correspond to the seven Jumpseat satellites, or the eight unidentified stars on the NROL-4 patch (my guess is that these relate to Jumpseat, plus one more spacecraft - either a Jumpseat that has been misidentified as an SDS, or something else). The three rivets could relate to the three original Trumpet satellites and the three trails to the three current satellites. Alternatively, the three could denote a third-generation NOSS doublet. The trail does appear to include eight or nine stars (the bull's leg may obscure one) behind the big one - if it were nine, then it could just be related to the nine secondary payloads. The bull's horns can be interpreted as either a symbol of the NOSS or Trumpet system; two gold horns for two satellites (NOSS), or symbolising a SIGINT antenna (Trumpet). Overall, NOSS does seem the most likely candidate, but I think it is far from definite. I have seen conflicting information about the Atlas version. Do we now know for sure, wether it is a 401 or a 411 version? Looks like an Atlas, and a Centaur are being airlifted to Vandenberg ( http://www.flightglobal.com/blogs/the-dewline/2012/04/volga-dnepr-airlines-asks-for.html ). Is NROL-36's ride already on site, or is it likely these flights? I wonder if it is fallout from the Delta Mariner bridge incident earlier in the year. I was assuming it was a 411, but I've been seeing more and more references to it being a 401. If it is a 401 I can't see it being NOSS or Trumpet; as either would require a four-burn profile to deploy the CubeSats. I would guess SDS, but it could be something new. Does the transport trailer explain the 40,000 pound Atlas Centaur III tank? I wonder if it is fallout from the Delta Mariner bridge indecent earlier in the year. With all the threats flying around the world, wouldn’t be surprised if as many NRO assets as possible get moved up a notch in the timelines. Beyond the current juggernaut of an EELV tempo? I think there is a phrase involving blood and a turnip that applies to getting payloads ready faster, raising the launch rate, and decreasing the amount of time needed for in orbit checkout. Both patches now out. Rocket is named "Rosie". The picture on the vehicle patch looks like a 401. 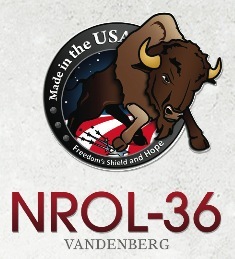 Vehicle will launch the classified NROL-36 payload for the U.S. National Reconnaissance Office. The earlier mentioned Horus has been dropped and replaced by a SMDC-ONE satellite. ORSES is in fact one of the two SMDC-ONE satellites, which has been slightly modified in a joint project with ORS, but i do not know, which one. Is it unusual for cubesats to be launched along with an NRO payload? As it is the first time, one could say it is unusual. But it might change. Well I thought I hadn't heard of it happening before but I didn't trust my memory on the issue. There were a couple of NRO-operated CubeSats launched on the Falcon 9 that carried Dragon C1, I'm fairly sure there haven't been any any launched on NROL missions though. Thanks for the additional detail on that. There are some photos on the ULA website of the spacecraft arriving at the launch pad. It is encapsulated in what appears to be the extended payload fairing, which would be consistent with NOSS or Improved Trumpet, and pretty much rules out SDS. Trumpet is too heavy for a 401, which leaves NOSS the most likely candidate. Presumably the mission will use the two-burn profile used on NROL-30, rather than the single-burn profile used on NROL-34. 1) How many burns is the Centaur going to have to make? I count at least four: the first to reach a parking orbit, the second to reach the NOSS deployment (~1000x1200 km) orbit, then probably two more to reach the deployment orbit for the CubeSats (~500x800 km). A fifth burn might then be made to deorbit the Centaur. 2) This reopens the question of why NROL-34 used a 411; at the time it was assumed that the change was to eliminate the requirement for the second burn, but since the second burn is apparently being reintroduced here, it is reasonable to speculate that there may have been another reason. I think this is unlikely to be anything completely different; since the inclination for the CubeSats is known to be around 63 degrees. Orbits with around that inclination are typically only used for NOSS, Trumpet and SDS. Misty used a similar orbit, but it would be far to heavy to fly on a 401, and I believe the follow-up programme was cancelled. While it leaves some questions unanswered, NOSS is definitely the most likely candidate based on the information available. Then again, my guesses are usually wrong, so we'll have to wait and see where the LHA and NOTAMS are. Has anybody heard anything about them? Another possibility is that after the NRO-L30 shortfall ULA/LockMart identified temporary and long-term fixes, but that the NRO wasn't willing to be the guinea pig. So they put NRO-L34 on a 411, someone else flew a long-coast mission that worked, and NRO-L36 went back to a 401. It might be possible to line up contract dates and such to rule this out, but I haven't tried.